There is a lot to enjoy in The Malice, Peter Newman’s exhilarating sequel to The Vagrant. Since the events of the previous novel, The Vagrant has settled down into a loving family life with Harm and their teenager, Vesper. In the south, the breach that flooded the world with demons is spitting out another enemy, The Yearning. With the entrance of this new adversary into the world, the sword is demanding to be used. When the Vagrant refuses the call of the sword, his daughter, Vesper, picks it up. This is a coming of age story for Vesper, who sets out as a naïve and chatty girl into a world she has no comprehension of. Her early, dubious decisions and half-truths made me roll my eyes at points but were plausible in the context of her age. Her actions set off a flood of events that sweep her across the world towards the breach, with a kid goat along for the ride. Her character development is fantastic, especially in context of her ability to make hard choices. She changes from someone unable to hurt the feelings of a baby goat to someone ultimately able to make major sacrifices. Vesper is worth sticking with as she evolves to become someone capable of thinking fast and questioning the status quo. I loved seeing the subtle shift away from bad guy/good guy logic as Vesper begins to shine a spotlight on assumptions about what is right and what is wrong. I suspect this is something Newman will play out in full in the next novel. The Malice, a sentient sword that once belonged to a member of The Seven (godlike beings of the Empire of the Winged Eye), is central to the plot of the story. Of perhaps more interest are characters that explore questions of identity and what it is to be human. These include The Harmonised, two people socially engineered to be so close that they are one in spirit. Assigned to protect Vesper, they make a perfect fighting team and their gritty realism provides a foil to Vesper’s innocence. However, the question soon arises: can two people truly think in perfect synchronicity? And how can someone survive when their soul is split in two? Samael is an infernal who used to be human and whose identity is in a state of plasticity, ready to be remodelled for better or for worse. Having the demons fuse with the “essence” of their human hosts rather than taking them over completely gives them a variety and texture that I enjoyed. It is played out to its best in Samael, who, despite his strength, is as daunted by The Yearning as any human could be. He knows that the sword is essential to its defeat. The history of Massassi, a woman born with power, is also wound throughout the novel, intersecting the otherwise linear timeline. Her story is set more than a thousand years before the main events—in an era of industrialisation and advanced clockwork—but reveals fascinating links with the present. This account of the origins of the breach and the Empire of the Winged Eye left me on the edge of my seat. Newman leaves his readers satisfied but with plenty of questions ready to be answered in the third book of the trilogy. I look forward to seeing more of Vesper’s interactions with the Empire of the Winged Eye as she seems ready to shake up the system. 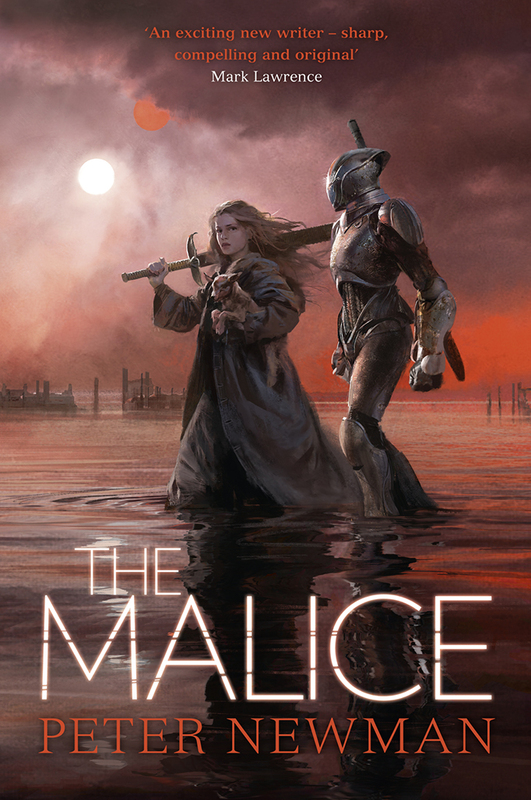 In all, I found The Malice to be an engrossing read, with philosophical and psychological questions underlying an action-packed plot. I’d thoroughly recommend it.